Finally, a way to hang your achievements on your walls. Next week, a new update will bring two major new features to our 2018 Co-op Game of the Year. The update will not only overhaul the deeds system by adding a new weekly challenge, but also finally provide a purpose for the empty picture frames that have been hanging on the walls of players' keeps for nearly a year. First, the weekly challenge. Each week, a new special challenge will be temporarily available in-game. "Every week is a new type of challenge – we call them mutators in-house,” Fatshark CEO Martin Wahlund tells me. “It's basically a different way to play an existing level.” In the first, whenever you kill a special enemy, it will split into two of a lower tier – based on the Warhammer concept of Pink Horrors splitting into Blue Horrors. “It lets us play around a lot,” explains Wahlund. “We have built a lot of different things, and some of them are just crazy. We could potentially do things like drop a lot of Sack Rats in the start of the farm level, so you can't see them, just hear them running around, and you try and catch ten in one minute. A lot of them are probably going to be [set across] full levels, because that's what people expect to play, but we could be more crazy if we wanted, which is nice. For now, weekly challenges will offer regular loot, but the eventual aim is to tie the challenges to a system that lets players earn specific cosmetic rewards through play. 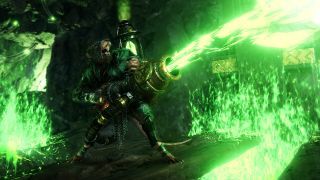 "If it's in a book, we can use it – and we are using it"
Talking to Fatshark, it seems much of Vermintide II's first year was spent improving the underlying tech and infrastructure, and learning how best to run a live-service game. Now that work has been done, next week's update is just the beginning. You'll find more details about Vermintide 2's major 2019 plans in the next issue of PC Gamer magazine, out in early March.